Peeling Skin, Dandruff, Sensitive and Irritated Skin. "Oasis" cream contains: Green tea extract, Dead sea salts, Calendula Officinalis, Sesame oil, Wheat germ, Evening primrose, Shea butter, Borage, Avocado oil, Hippophae rhamnoides oil, Tea tree, Lavender, Bergamot, Geranium maculatum oil, Vitamin E.
While most cosmetic creams are based on paraffin and petrolatum, "Oasis" cream is based solely on Shea butter and natural plant and aromatic oils. Paraffin and petrolatum are manufactured from oils that block the pores of the skin and even damage and destroy the body cells. To counter this damage "Oasis" contains Dead Sea salts that are rich in minerals from the natural source and are able to reconstruct the skin in order to protect it from different skin diseases (dermatosis). Evening primrose oil – contains vitamins A, E, and F, rich with linolenic and gamma acid. Tea tree oil - disinfects infections and prevents them from spreading, spurring gall scabs. Shea butter – the Shea tree grows in Africa and Shea butter is produced from its fruits. Shea butter is solid at room temperature and in this form it is able to calm and soften the skin. It treats skin diseases, dermatitis and dry and irritated skin. Shea butter acts as a natural repellent to the sun with the equivalent of SPF 3 -4 protection. Green tea – Dr. Steven Hsu, an expert of cell biology, from the Georgia school of medicine, in the U.S.A., has recently published research that confirms Green tea contains polypropylene of the EGCG type of natural anti-oxidants. Anti-oxidants are materials which neutralize free radicals that might cause cancer by altering the structure of the D.N.A. Polypropylene protects healthy cells and contributes to the treatment of cancer cells. The polypropylene found in the green tea also rehabilitates dying skin cells and thereby slows down the formation of wrinkles and the aging process. In addition, they treat various skin diseases such as Psoriasis, Seborrhea and Dermatitis. The research was published in the "Journal of Pharmacology and Experimental Therapeutics". DIRECTIONS: Apply generously twice a day and gently massage. 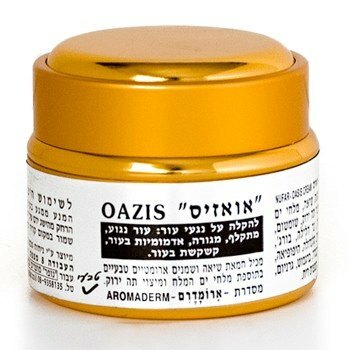 Oasis is a significant Israeli development on the purification of natural ingredients, without Vaseline, paraffin, preservatives or chemicals that are used in equivalent preparations to stabilize the cream and to bond the fatty molecules with water and moisturizers. The foundation of this cream, which is used to treat dry and peeling skin and many skin diseases, is Shea butter with the addition of natural aromatic oils. The Shea tree grows in Africa. A natural oil is produced from its nut that solidifies at a temperature below 37°C. Thus, a natural butter is produced which nourishes the skin with natural amino acids that protect it and retard the aging process. What is special about Shea butter is the fatty acids it contains, oleic acid and stearin acid, that encourage skin cell growth and regeneration. In addition to this, it includes kinamic acid and other natural ingredients with such properties as healing, repairing and recuperating the skin. This, with the addition of natural aromatic oils, makes this cream efficacious in treating very dry or cracked skin, rashes (primarily in the summer), as well as psoriasis, eczema, skin inflammations, seborrhea and dermatitis. This cream is excellent in softening especially hard skin on the soles of the feet and elbows.